Antech Wire EDM Inc. sponsors a 7000 lbs Light Prostock Tractor called Mad Money. Antech Wire EDM Inc. has created many custom parts and components for this project, which has in turn created a new line of products for Antech Wire EDM Inc.
Antech Wire EDM Inc. has created a sister company called Antech MotorSports which now sells several parts we have designed and invented along with recreation of old parts no longer available for purchase. 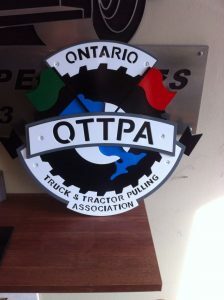 Mad Money runs with a club called OTTPA (Ontario Truck & Tractor Pullers Association). We pull at events all over Ontario follow the link below to their website and you can see where you can find us next! 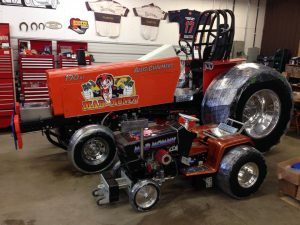 Driver Bio – Robert Alves started into Tractor Pulling at a very young age. He started helping his father build their sled at the age of 7. They built and ran the sled together until he was 25. Robert Alves knew he could not just sit on the sidelines after building and running the sled for so many years. So Robert Alves put together his 7000 lbs Light Prostock and saw the sport from a new angle instead of driving the sled he was now pulling the sled. 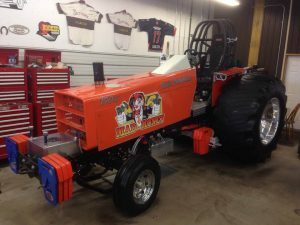 Robert Alves has even created a mini puller (Lawn Tractor Puller) called Mad Mommy for his daughters to drive. pictures on the two tractors being built and running the OTTPA circuit.